The great thing about green computer circuit board is that there’s still so much of it sitting around, out of date and useless, just waiting to be made into something else. And since it’s already green, why not use it as the base for Christmas Trees? If you don’t happen to have any old circuit boards lying around your house, just ask your friends ~ you’ll probably have boards coming out your ears by the end of the week! 1. 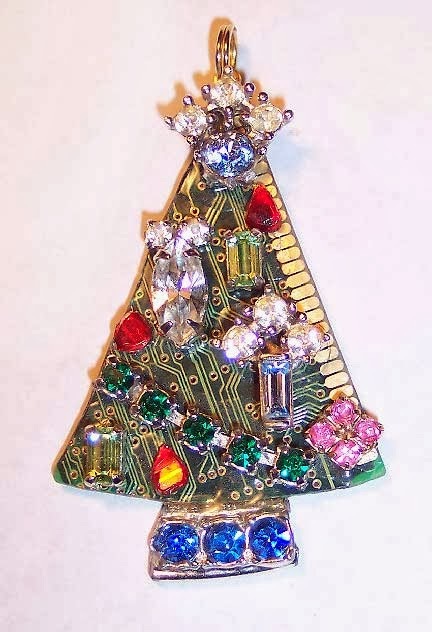 Cut a classic Christmas tree shaped triangle from the circuit board. You can create a paper pattern, draw the shape on the circuit board or just cut freehand. I like to gently round the bottom edge of my tree, but it’s slightly easier to cut it out straight. To cut these out, I have used both a jig saw and a hand-held coping saw with equal success. You might have to cut and pry off a few components to avoid dulling your saw, but it’s possible to cut right through just about everything if you have the right saw blade. Or if you’re willing to sacrifice it! 2. File all the cut edges of the circuit board. 3. Cut apart and file the edges of your broken jewelry. Rhinestones are particularly effective in creating sparkle, but don’t overlook more classic styles, including plain metal and thermoset plastic. Look for a piece that will simulate a tree trunk if you desire one, and be particularly careful in choosing the piece you use for the star on the top of your tree. 4. Move your pieces around until you achieve the layout that you want. 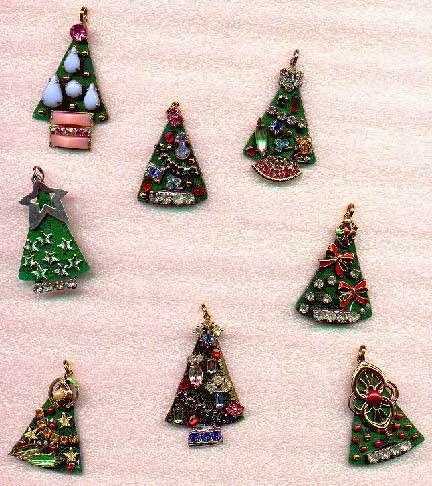 You might want to do this on a paper pattern of your tree to make placement easier when it’s time to glue them. 6. After the front is dry, flip the tree over and epoxy a hangtag to the top of the back, with the hole extending up just over the top. Let it dry thoroughly. Slip a jump ring through the hole, a chain through the jump ring, and start thinking about what to do with all the rest of that circuit board! What a neat recycle, Cyndi! This is a great idea. My son fixes computers so I can have lots of fun with this. Thanx for sharing.